Detail from a series of Illuminated Universal Turing Machines, Manchester, 1998. This is one of a series intended to honor A. Turing's work. The operating system of a general computer may be viewed also as a Universal Turing Machine (UTM) because general computers are, in principal, capable of computing all procedures that are computable. It was Alan Turing (1912-54) who outlined such a procedure in his 1936 paper on "Computable numbers. . ." published by the London Mathematical Society. This paper addressed a logical problem known as the "Decision Problem", whether there is an algorithm (a step by step procedure) for deciding the truth of all arithmetic statements. Turing's negative solution demonstrated that there is no algorithm that could, in principle, decide the truth of all arithmetic statements. By showing what is not computable he pointed to the procedure for computing all that is computable. When a general computer displays a version of a UTM it displays the ancestral logic for its own operational self, a "Self Portrait"
Rationale for a "Universal Turing Machine Self Portrait"
For me, the text of a UTM algorithm, like a medieval biblical text, radiates an aura of authority even though difficult to comprehend. As an artist I have written algorithms for illuminating a Universal Turing Machine (UTM) and to celebrate its impact on our culture. These illuminations are works of art and not exercises in computer science. They are intended to celebrate the value and significance of the UTM in shaping cultural change in the late 20th century. To honor the UTM text more broadly the "Self Portrait" version on this web site is presented as a cyberspace typographic illumination. Like medieval Latin that transcended the vernacular and was universally understood by those schooled in Latin so also this algorithm speaks a universal tongue understood by those schooled in computer science. Circuit Man: Tetra Corporation Memorial, Minneapolis, 1969. Working circuit, test model for processing information. Hardwired circuit logic originates in algorithmic procedures for the gating logic. 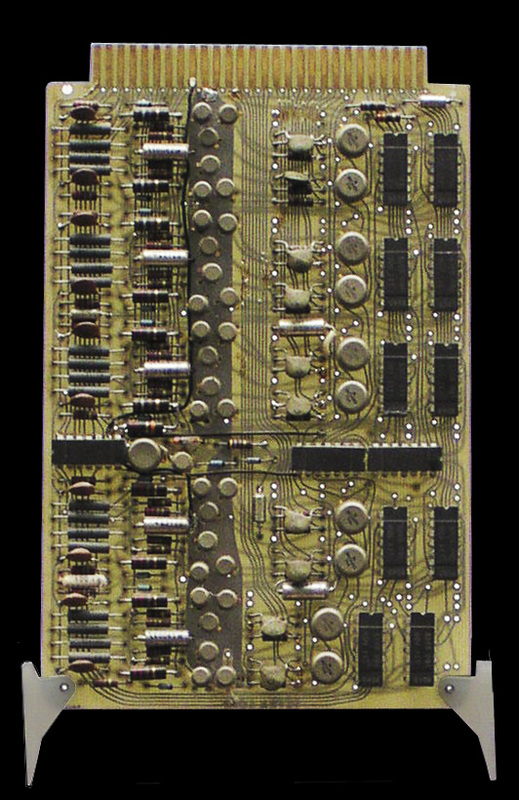 Software, as an algorithmic procedure, becomes "hardware" when it is translated into a hard wired circuit. The term "software" did not exist in the early days of computing. While its first usage remains uncertain it is John Tukey (1915-2000) who is credited with coining the term "software" for its use in print in 1958. OPERATION. Turing's paper outlined a procedure that could be carried out by following a simple instruction, one step at a time. Because the instruction path could be implemented mechanically it was theoretically possible to make a machine to carry out the operation. When Turing published his paper the term "computer" referred to humans who performed computation. During World War II hundreds of "computers" (humans) were employed for the immense calculating tasks required for breaking codes and creating accurate targeting tables for artillery. Even with advanced calculating machines these human computers were too slow and inadequate for the complex calculations required. The development of universal computing machines with stored programs & memories emerged after World War II. In his book on Turing's Cathedral George Dyson identifies the role of Turing's thesis in that emergence. Today, the computers we use for everything from our social networks and banking to email and gaming are general computers. 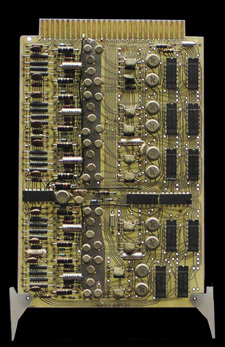 Turing's procedure for a "U" outlined the logic that underlies the operation of general computers. THE SELF PORTRAIT, HISTORY. As an algorist, working with algorithmic art, I became aware of the beauty of the UTM procedure when I came upon "U", an expanded binary version presented by Roger Penrose in The Emperor's New Mind. The "text" for a UTM, the meta-algorithm of algorithms, seized my imagination and would not let go. To me it symbolized a historical turning point in the human ability to manage extensive rational procedure. Many are not aware of the time when "computers" referred to humans who did the computing. Businesses required teams of human "computers" to do laborious computation that is now done with machines. Imagine the many millions of human "computers" the world would require if we had to use human computers to manage data for today's finance, communications, and food supplies! Those who recognize the power of algorithmic procedure implemented with computers will appreciate the beauty and power of Alan Turing's contribution and recognize its special place in the history of ideas. FORMAT CONSIDERATIONS. Several versions of a UTM are documented below. The Gunhouse version, employed in the self portrait display, employs cyberspace typography and is organized with Fibonacci numbering. The movement of the binary digits is intended to suggest the movement of the tape in Alan Turing's original conception. The scrolling feature allows the full text to be virtually present within the physical limits of the window frame . The marque movement displays all the text flowing back & forth from left to right. The complete text is present in the HTML source code and in the documentation below for F0.UTM. B0.UTM and F0.UTM. Text quoted from correspondence with the author, Steven V. Gunhouse. U, see Note 7, page 71, Roger Penrose, The Emperor's New Mind. . .( Oxford University Press, 1989). George Dyson, Turing's Cathedral: The Origins of the Digital Universe, 2012, Pantheon. Wikipedia entries for "Entscheidungsproblem" and "Universal Turing Machine" provide a good brief intro to the subject. WWW: See the Alan Turing Homepage maintained by Andrew Hodges. His scrapbook page on Turing Machines includes useful material. For a discussion of the Golden Section (phi) in art and geometry see: H.E.Huntley, The Divine Proportion (Dover, 1970); Matila Ghyka, The Geometry of Art and Life (Sheed & Ward, 1946). The Manchester Illuminated Turing Machine, pen plotted works on paper, Verostko, 1998. NOTE 1: George Boole's classic work on the investigation of the laws of thought (1854) identified the Aristotelian principle of contradiction as the ancestral logic for Boolean operators that have played a central role in both hardware and software gating logic. PROPOSITION I. To deduce the laws of the symbols of Logic from a consideration of those operations of the mind which are implied in the strict use of language as an instrument of reasoning. . . The literal symbols of Logic are universally subject to the law whose expression is X2=X. Of the symbols of Number there are two only, 0 and 1, which satisfy this law. PROPOSITION IV. That axiom of metaphysicians which is termed the principle of contradiction, and which affirms that it is impossible for any being to possess a quality, and at the same time not to possess it, is a consequence of the fundamental law of thought, whose expression is X2=X . This binary version is quoted from Roger Penrose in THE EMPEROR'S NEW MIND: concerning computers, minds and the laws of physics ( Oxford University Press, 1989). Chapter two, "Algorithms and Turing machines " provides a detailed presentation of Turing machine logic including step by step procedures for structuring a simple machine. As an artist and non-mathematician I found this chapter very helpful.